Heading north for the Grenadine islands, we wanted to expose our guests to some of the areas that we had already explored and thus stopped for two nights at Ronde Island, situated between Grenada and Carriacou. We enjoyed a short hike on Ronde Island. We could not resist a lunchtime anchorage at one of our favourite spots, Saline Island, just south of Carriacou as that offered one of the island’s best snorkeling spots. We were rewarded with a view of the only Flying Gurnard that we have seen thus far in the Caribbean; massive compared to those at Ilha Grande in Brazil. Frank and Marijke at Saline Island. Another familiar spot that we wanted to showcase was Sandy Island, off the Carriacou capital, Hillsborough. After a night at anchor, we swam from Moondust to explore this picturesque little spot on foot. For Pete and I it was time to move on from the Grenada island group and head north to the Grenadine islands of St Vincent. As we wanted to be at the immigration and customs offices first thing in the morning, we moved to Hillsborough for the night. Enjoying rum punch at Cuthbert Snag’s beach bar. Arriving at the offices promptly at 08:00 we were informed that, as from that very day, the customs office in Hillsborough was closed and that all yachts and crew now had to clear out in Tyrell Bay. The immigration officer assured us that his colleagues in there would have no problem if Pete cleared me out, and so whilst he took a minibus taxi (similar to those in SA) to Tyrell Bay, the rest of us did some last minute shopping, which included a pair of flippers for Marijke. Island hopping in the Caribbean is indeed great! It took us a mere two hours to sail from Carriacou to Union Island, where we had to check in for St Vincent and the Grenadines and buy a new local simcard. As we wanted to make the most of the few days that Frank and Marijke would be aboard Moondust, we opted to head immediately for Tobago Cays (pronounced keys) Marine Park which consists of a number of uninhabited islands and reefs. What a delightful area! Jamesby, one of the picturesque uninhabited islands in the Tobago Cays Marine Park. Encountering plenty of dead coral, it was unclear if this was caused by climate change (a two degree rise in sea temperature) or hurricane damage. Nevertheless we were astonished at the number of sea turtles that we encountered at Baradal Island and the extraordinarily big fish that we saw whilst snorkeling at Petit Bateau. En route to Petit St Vincent, which is a stone’s throw away from Petit Martinique from where Frank and Marijke would get a ferry back to Grenada, we anchored at Mopion Island, a small sandy islet amongst the reefs. After saying our farewells, Pete and I headed back to Tobago Cays as we wanted to enjoy more of this special area. We anchored off Petit Tabac and, without knowing it at the time, swam to the island onto which Captain Jack Sparrow and Elizabeth were washed up in Pirates of the Caribbean I. We only realised it when watching the movie that evening! Pete on Petit Tabac, the island featured in Pirates of the Caribbean. We next anchored overnight at Petit Bateau and ‘circumnavigated’ the island while snorkeling; about a 1km swim. We were delighted to see some more gigantic fish specimens as well as fields of new green coral which reminded me of the rolling green hills of fynbos in the Western Cape. Adverse weather forced us to move from Tobago Cays, which is very exposed, to a more sheltered anchorage. Then, as the wind was predicted to be east-southeast for only one day, we decided to make use of this favourable weather window and head north to Bequia (pronounced Bekwe), another Grenadine island. We had a very pleasant day sail and once again feasted our eyes on the violet blue of the Atlantic ocean, with flying fish welcoming us back to deep water. At 15:00 we anchored in Friendship Bay on the southern end of the island. 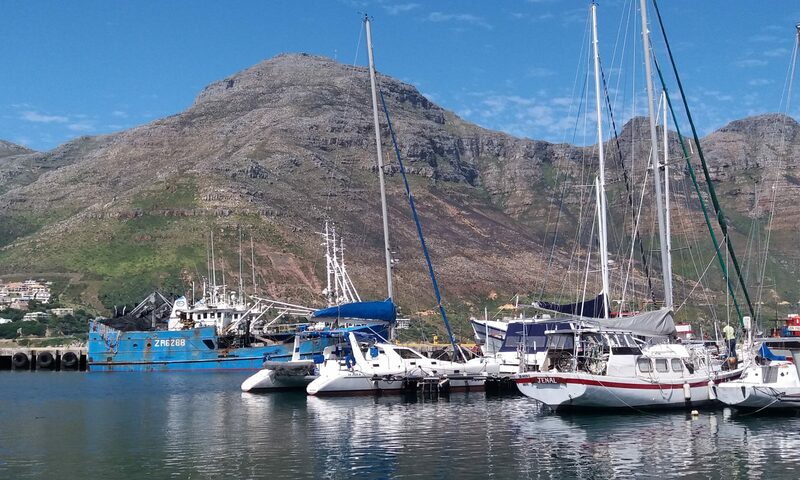 The next day, after walking the 2km over the hill to the capital, Port Elizabeth, to do some shopping and get laundry done, we decided to sail Moondust to Port Elizabeth and stay for a week or so. Doubles are as typical to the Caribbean as vetkoek is to South Africa! Doubles consist of two ‘pancakes’ with chickpeas and a choice of potato, butternut or chicken with sauce added. Delicious! Bequians are descendents of settlers who came on whaling boats from North America, from farms in Scotland, from France as freebooters, and as slaves from Africa. We found this small island extremely charming since it is well developed but not too touristy. Princess Margaret Trail, which lines the waterfront of Port Elizabeth, has quaint restaurants and shops. The local ‘boat boys’, as they are referred to, are great entrepreneurs and offer services via VHF radio which range from picking up and delivering laundry, as well as freshly baked bread, ice, water, diesel, fish or lobster . They are friendly and professional without being pushy, unlike in some places where persistent boat boys can be quite a nuisance. Bequia is the first of the Caribbean islands that we have encountered that recycles plastic, glass and cans. Clearly marked bins are conveniently placed all over the island, next to normal garbage bins. We have often wondered what the other islands do with all their garbage and fortunately we have seen very little rubbish in the water so far. Admiralty Bay is a popular anchorage off Port Elizabeth. We found the most beautiful coral just a swim away and enjoyed the spectacular seabed, rich in urchins, anemones and different types of soft and hard coral. Some of the round coral rocks are festively clad with aptly named Christmas tree and Feather duster fan worms, all in a variety of colours. Both types of worm instantly retract into little holes or pipes as soon as they detect any movement in the immediate surrounding water . We also used our time in Bequia to have a foredeck awning made, do some maintenance and put reinforcing epoxy/glass fibre backing plates under the stern and bow deck cleats in preparation for the turbulence in the locks during the Panama Canal transit. From Bequia we’re heading north to experience more of the Caribbean ‘proper’ and are really looking forward to my daughter and her boyfriend’s visit in Antigua during December. In our next blog, which will follow in a few days, Frank and Marijke will share their impressions as Newbie sailors on a yacht. Don’t miss it! Nice colourful video’s and photograps! Good to read you continued so nicely. Indeed I have hopes the coral regenerates. The deeper, the healthier it is, so I suppose the hurricane did damage to the surface coral that must have been more exposed. Ek het geweet jy sal van die beelde hou. Dit was werklik amazing! Wow your sure having some beautiful places to visit . Thanks for all the pictures and the films under water . So interesting . All the best from us all in Cape Town . Just wonderful! I love it! Hi Pete ,Karin , It all looks amazing . Really enjoy your pics and stories , always look forward to your next instalment . Love to you both , safe adventures . Amazing videos and photos – blue waters, stunning beaches and very yummy looking “doubles” – I am enjoying the journey as much as you both are ! Wonderful to know that you are travelling with us! We won’t have one in a month or so… to busy enjoying the good life!!! Just love your blog. Look forward to each. You’ve done some nautical miles, seen great places along with a lot of swimming ! Great under water pics. South East winds doing their thing in Hout Bay now, summer is here! Fair winds, calm seas, enjoy. Great to hear from you, Athol! Comments like yours make all the hard work of producing the blog worthwhile. Glad you are travelling with us in spirit. Greetings to everybody in Hout Bay.